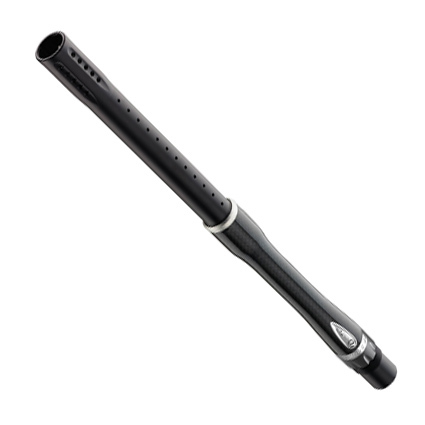 Premium Paintball Products – Canada’s Best Stocked Proshop Dye Carbon Fiber Boomstick Paintball Barrel - 15"
Introducing the all new Carbon Fiber Boomstick™. Players have always desired a barrel with stainless steel precision, but strive to keep their equipment as lightweight as possible. The new Carbon Fiber Boomstick™ now gives players the best of both worlds. Featuring a unique and proprietary stainless steel insert with a carbon fiber outer sleeve, the Carbon Fiber Boomstick™ brings barrel technology to a new level. The special blend of materials allows us to micro hone our barrels to a mirror finish while providing you with a lightweight barrel, lighter than our popular Ultralite Boomstick™. The stainless steel insert is built from gun drilled surgical grade 303 stainless steel and aircraft grade carbon fiber. The inside bore is honed to a 6 micron surface finish, giving you the smoothest and straightest barrel surface on the market. Carbon fiber provides a high strength-to-weight ratio, and the density of carbon fiber is considerably less than that of stainless steel, making it ideal for this barrel application resulting in an extremely light and accurate barrel. Combined with DYE’s trademark muzzle break design, the all new Carbon Fiber Boomstick™ is quiet, aesthetically appealing and will once again set the standard of high performance in the barrel market. The all new Carbon Fiber Boomstick™ undergoes a unique process of combining a stainless steel micro honed insert with that of the highly acclaimed carbon fiber material. This process allows us to provide you with the most accurate and lightweight barrel on the market today. Other barrels on the market use carbon fiber, but not in the way that we do. The surface the paintball travels on is actually micro honed surgical grade 303 stainless steel, wrapped in carbon fiber. This stainless steel surface is the most accurate of all materials available. It allows us to hone the surface so perfectly, it is comparable to 1/3 of a human hair. Unlike other carbon fiber barrels on the market where the paintball actually travels against the weave of the carbon fiber, ultimately leading to it’s degradation and decrease in accuracy over time, the Carbon Fiber Boomstick™ barrel provides you with long-term accuracy and consistency. With the all new Carbon Fiber Boomstick™ you will have stainless steel precision with extremely light weight performance. Truly, the Choice of Champions™. DYE Carbon Fiber Boomstick™ barrels are available in bore sizes .684, .688 and .692 and 15” and 17” lengths.